Pupil Premium funding was introduced by the Government to help support disadvantaged pupils (defined initially by their eligibility for Free School Meals at any time in the last six years). The funding aims to enable schools to take the most effective actions to improve outcomes for disadvantaged pupils and eliminate the gap in performance between pupils from backgrounds with different levels of wealth. 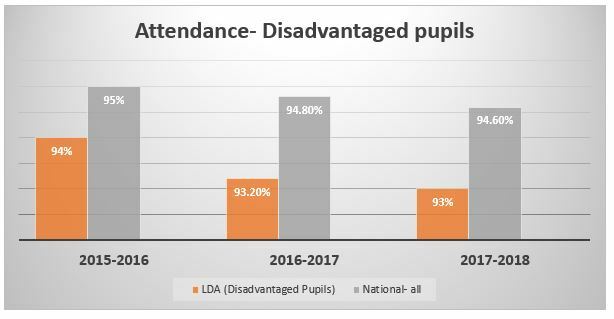 Lord Derby Academy is allocated an amount each April by the Education and Skills Funding Agency (ESFA), depending on the number of disadvantaged pupils on-roll as at the January census. It is then for the Academy to decide how this money is best spent to have the maximum impact on overall pupil achievement and experience. Parents can click here to check their child’s eligibility for a free school meal. Click here for information about Pupil Premium funding at Lord Derby Academy for 2018/2019 and about our Pupil Premium cohort profile. To design our plan, we adapted Sobel’s principle of spending the pupil premium money (2018). Establishing our pupils’ barriers play a crucial role but we also recognise that disadvantaged pupils are not a homogeneous group. One size-fits-all interventions are not the most cost effective. Our pupils are influenced by their interaction with a range of people both in the school and the community, and in different settings (parents, canteen staff, staff in student services area, receptionists, wider community, services, etc.). Gathering different stakeholders’ views also supports with building a picture of the context of our pupils. Click here to see the barriers we have identified for 2018/2019. Previous spends, current and previous pupils’ data played a significant part in the design of our plan. Click here to see a review of 2017/2018 spends. Finally, good practice is informed by wider research. We use the findings of bodies such as the EEF (Education Endowment Foundation) or current educational research to guide our thinking and review our practice. 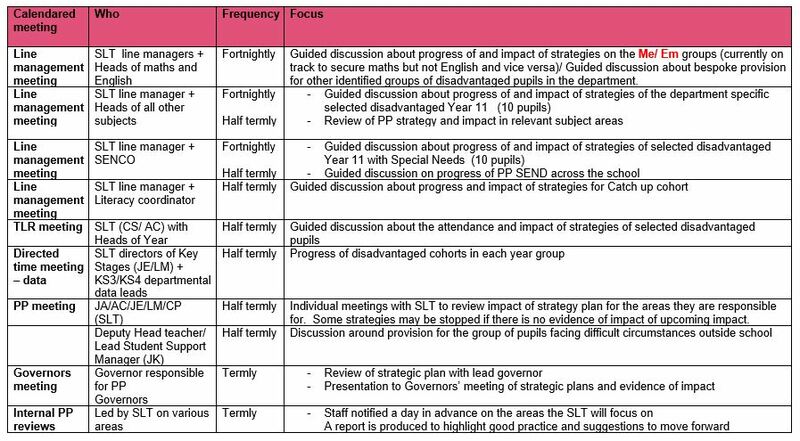 Our Pupil Premium strategy is reviewed termly by governors and on an annual basis. The next review is December 2018. Adjustments are made to our improvement plan according to the impact of strategies on improving outcomes. We recognise the importance of evaluation and the need for this to be robust to ensure the approaches we are using are effective and represent excellent value for money. Our annual review in September 2019 will involve staff (including support staff), pupils, governors, parents & carers, and external partners. Our work in relation to Pupil Premium is reviewed regularly to ensure it is having the intended impact in raising standards (see table below). Key leaders across the school meet regularly to discuss our database of bespoke provision, of provision for all disadvantaged pupils in general and the impact of the provision; a proforma guides the discussion with questions to answer. We respond rapidly and make adjustments if particular strategies are not working as well as expected. The review and monitoring is also carried out through parental and pupil forums/surveys, work sampling, data captures and lesson drop in observations. The information gathered from these meetings is collated centrally for the Deputy Headteacher to access. Key headlines based on findings are reported half-termly to the whole school via a half-termly newsletter and whole school staff meetings. Please click here for the Pupil Premium Autumn Term 2018 and Spring Term 2019 activities. For more information on Pupil Premium please contact our newly appointed Director of Pupil Premium, Mrs Arnold.